Rory McIlroy's successful summer has led to him being named PGA of America Player of the Year and the Vardon Trophy winner in the US. It marked the second time in three years that the Northern Irishman, 25, has picked up two awards. 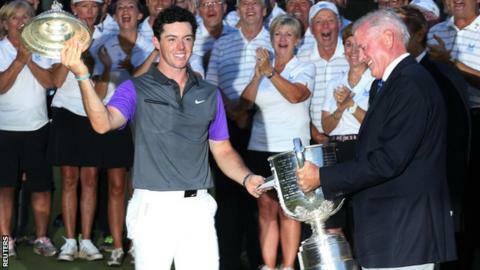 McIlroy won consecutive majors as he landed the Open Championship and US PGA title, which came either side of his WGC-Bridgestone Invitational triumph. The world number one could also land the PGA Tour Player of the Year award. That honour will be announced on 9 October. McIlroy posted an adjusted average of 68.82 through 66 complete rounds, edging Sergio Garcia [68.95] - who completed 61 rounds - to win the Vardon Trophy. Masters winner Bubba Watson was a distant second to McIlroy for the Player of the Year award, with US Open winner Martin Kaymer third, followed by Jimmy Walker.